Family Legacy recognizes that the role of caregiver can mean so much more than just medical attention. 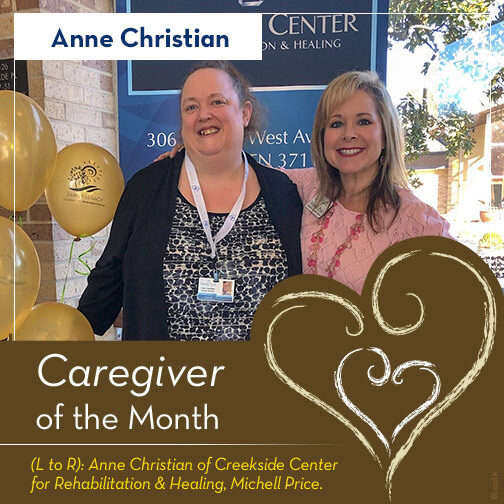 Anne Christian, of Creekside Center for Rehabilitation & Healing, is a true example of this idea and what it can mean to a family. My mother, Bev King, was in this facility for 2 ½ years, with progressing Dementia. Anne was there most of this time. She is such a giving and caring person, I wish she could be recognized for this. I have no spouse or family in the TN area, only my adult son. Trying to understand and cope with Mom’s disease was so over whelming and there were many times when I felt very alone and helpless. Anne recognized the fact that the families often needed more than the residents. Anne gave me the strength I needed to be strong for my Mom. Anne mainly worked the front desk but she was the best “caregiver” there.